Most homes involve a lot of activity in and around the kitchen, from cooking, cleaning, eating, drinking, and socializing. Therefore your kitchen’s design style is essential to ensure you achieve a practical and elegant space. Obstructing the kitchen triangle – The kitchen triangle includes the sink, stove, and refrigerator. These appliances involve the greatest activity and if not planned right can cause obstructions. 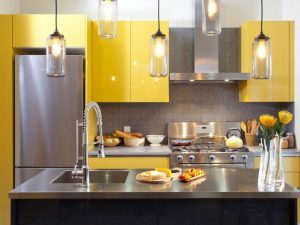 Your sink will depend on your plumbing, but other items like your stove and refrigerator can be placed in other areas of your kitchen’s design. Options include L-shaped, galley, U-shaped or island. Make sure that your area is not too small or too large, to ensure an efficient cooking space. Wasting storage space – Storage is a must for a kitchen as you will need space for plates, cups, and cutlery plus cooking appliances like food processors and stand mixers. Look at designs with upper and lower cabinets. Include drawers for small items and tall and short shelving for other kitchen essentials. Inadequate counter space – Counter space is key to make sure food preparation is easy and quick. Look at adding counter space with an island. Poor lighting – It is important that your kitchen has sufficient light to ensure that food is safely cooked. Add lighting below your overhead cupboards to illuminate the countertops. Forgoing a backsplash – It is a must to have a backsplash to reduce the damaged caused by water and grease in the kitchen. Look for materials like tile, metal or plastic than paint or wallpaper.